I’d wanted to be King of the Mountain for a while. How do you get to be King of the Mountain? By cycling a route faster than anyone else, that’s how. If you download the Strava app onto your phone you can select a route and see how fast others have done it. Or you can make your own route. I live in Cornwall and around Penzance there are plenty of Strava routes that I tried, and I quickly realised that although I was fast, I would never be the fastest. No King of the Mountain in Cornwall for me. But I could make my own route. I work for a charity that provides immediate aid to parts of the world when they experience an emergency. It doesn’t matter what kind of emergency – volcanoes, earthquakes, wars – we will provide fast and urgently needed relief for people who have lost the most basic things in the immediate aftermath of a disaster. My work for the charity means that I get to go to out of the way places, and last year I was in Turkey on the Syrian border, working on the complex logistics for relief deliveries into Syria. Not easy. My years working for the charity meant I was trusted with organising these difficult missions. I was mentoring a potential team leader and we were under strict instructions not to put ourselves at unnecessary risk in an area that was so close to the civil war in Syria. Reyhanli is quite isolated. Not many cyclists from Cornwall get there! Particularly not many who have any interest in becoming King of the Mountain. This, I realised, was my chance. If I could set up a route and put it in my Strava app, I had a good chance of becoming King of the Mountain. Trouble is, no-one had a bike and no-one spoke English. 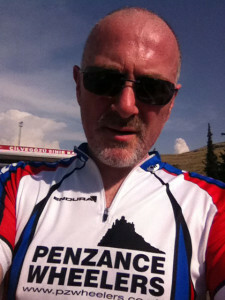 I did have my Penzance Wheelers cycling top though and that seemed like a good start. Down the road from where I worked was a shop. And there was a young boy hanging around the shop. He looked about nine and he had a bike. OK so it was a kid’s bike. It had gears, but no cables and there were no brakes. But in my opinion it qualified as a bike. All I had to do was borrow it. I went up to the boy (whose name I still don’t know) and did the usual Brit Abroad trick of waving my arms around and speaking loudly. Somehow he seemed to understand my ridiculous gestures. I offered him my watch in exchange for the bike and said I would be back in an hour. That was cool – he said OK and probably thought I was crazy. So on the 17th May 2013 I started my Strava app, set off from Reyhanli and cycled along the Turkish/Syrian border heading towards the border at Cilvegözü, the busiest land crossing point between Syria and Turkey. I soon realised that cycling with no water and no sun cream was a mistake. And I was slow. A nine year-old’s bike is not designed for speed especially when there are no gears. I crouched down into an aero position and pedalled like fury, desperate to get to the Olive Tree café at the border. 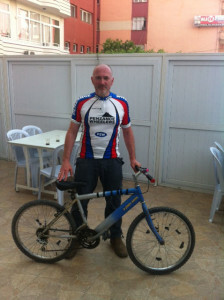 I cycled against a stream of traffic coming away from Syria and have no idea what people thought of the mad Brit on a tiny bike cycling along a dangerous border road, and I did not stop to ask them. I got to the Olive Tree café at the border post. It was here that Syrians had been pouring through for months becoming part of the huge mass of refugees that are living in Turkey these days. They are needy and homeless, driven out of their country by conflict and civil strive, often leaving loved ones behind. I couldn’t stop for water at the Olive Tree – I had lost too much time. I swiftly turned around and headed back through the heat and the dust and the traffic, back to the corner shop where the boy was still waiting with my watch. As I pulled up I checked my app. There it was – the 16 km route marked by GPS, and the official time of 1 hour, 7 mins and 42 secs. I was King of the Mountain, and I still am. Nobody has tried to beat my time and probably no-one will. I could be King of the Mountain for that stretch of the Syrian border for years to come. My triumph was short lived. On the 11th of May, less than 24 hours after we had left town, two car bombs exploded in Reyhanli. 51 people were killed and 140 injured. The Syrian civil war had come to Turkey. It was a shocking reminder of why I was there and underlined the necessity of the work I was doing. On my return to the UK my charity found out about my dash for fame. I was well and truly carpeted. I had put my associate at risk by leaving him unattended (we were supposed to stay together at all times). I had courted kidnap, assault and possible death. I had risked the security of my mission and could have put the charity in a very bad light. My escapade had been frivolous and foolhardy. I was suspended and had to undergo retraining. So, being King of the Mountain isn’t everything. I still smile inside at my madcap ride but would happily swap it for an end to the bloodbath in Syria. Maybe I should go for something a little less risky. Has anyone cycled round the rim of Vesuvius recently?